And collisions work with multi-axis roatations. Cool. Starting the OpenGL 4.0 Shading Language Cookbook. Hmm. I need to understand how the camera is setup in OGL 4.0. This entry was posted in Feldman Project, Phil on January 31, 2012 by pgfeldman. Amplifiers need a resistor on the rheostat signal line, capacitors on the power in pin, decoupling capacitors on the signal in and audio out lines. large data seems to be passing properly, Started tailoring the test to work with the data dictionary instead of arbitrary data that I set up. This entry was posted in Feldman Project on January 31, 2012 by pgfeldman. This entry was posted in Mike on January 30, 2012 by pgfeldman. Adding environment methods that will coordinate the interactions of the objects. Cleaning up Arvo’s so that only 3D collisions between solid objects are calculated, with a resulting unit penetration value. Collision detection and response are now working! Adding a few more cubes to collide with. Then work on global to local mapping so that I can have the cubes at arbitrary angles. Added the cubes, now I need to clear and sum the collision forces each time through. Done. After spending the entire afternoon unrotating objects in my head, I got the projections onto the object in it’s coordinate frame working. So bounding boxes work at any arbitrary angle. Whee! This entry was posted in Feldman Project, Phil on January 30, 2012 by pgfeldman. I realized late last night, that using Visual Micro, the arduino might be able to use libraries files. This can probably also be done manually with a .make file. It was switching states too fast. It wasn’t switching back to ready on the end of a recieve. This entry was posted in Feldman Project on January 30, 2012 by pgfeldman. This entry was posted in Dong Shin, VISIBILITY on January 27, 2012 by pgfeldman. Visibility documentation for Program Assistant sent to Mike and Dong for Rollout. Dong/Mike assisted me with TortoiseSVN – username/password. Transferred all documentation documents to server. Mike and Dong to work on uploading documentation to classified server for customer use. This entry was posted in VISIBILITY on January 27, 2012 by pgfeldman. If the distance from the “center” (average of all points) to the collision point on the plane is less than the distance from the “center” to the test point, then the collision is happening outside the hull, and the force can be calculated based on the difference between the collision radius and the surface. Otherwise, it’s within the hull, and the force is based on the collision radius + the distance from the polygon. Looks like we can use Arvo’s algorithm. Going to see how this works. Discovered Arvo here at Gamasutra. Went well. The work would be entirely on site. Ah well. Got Arvo’s in. I can clean it up so that the collision test is only for solid shapes, which will allow me to get penetration values out of the collision. 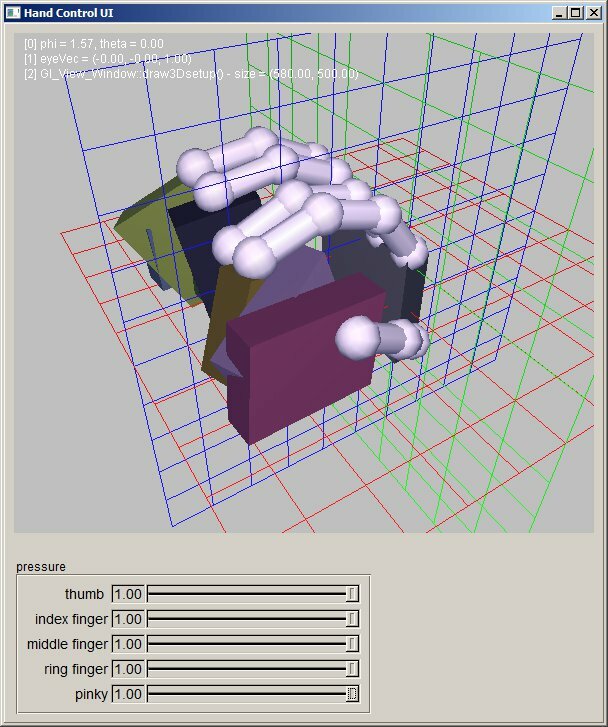 There was one tricky bit – I had to get the viewpoint matrix multiplies out of the collision calculations. So now there is a render() pass which draws, and a calculateCollisionPoints() that is called at some other time without any glBegin()/glEnd() blocks, and starting with an Identity matrix. I then pull the result of all the calculations off the matrix stack and save for the collision calculations. This does need to be cleaned up, but it’s not bad. This entry was posted in Feldman Project, Phil on January 27, 2012 by pgfeldman. Handshaking seems to be working fine, data is not coming through properly though. Got distracted by Server stuff for a while. I will hold off on migrating data til next week, when I am done with this communication stuff. This entry was posted in Feldman Project on January 26, 2012 by pgfeldman. Added text within the 3D environment, partially to show Dong how it’s done, but also because it could be quite useful. It’s in the DrawableObject base class. This entry was posted in Feldman Project, Phil on January 26, 2012 by pgfeldman. Made it so reciveData returns boolean. This way the state will only change if it receives successfully. After lots of troubleshooting, basic handshaking messages seem to be transferring properly. Changed test to be able to test sending data. iText seems to be the most widely adopted. It has lots of documentation, examples and is pretty straightforward to use. It has a very complicated licensing / pricing structure though. PDFJet is a fairly established option with documentation, examples, and almost as many features as iText. It also has a simple flat commercial licensing fee of $295. PDF Clown is the last reasonable option I saw. It is the least developed of the three lacking even an automatic layout however it is completely open source. This entry was posted in Mike on January 25, 2012 by pgfeldman. More on the HandControlUi and RightHand proper. Added a clock to calculate elapsed time between frames for physically-based modeling. Got the basics of the hand working, but I need to rework the eyepoint/model control. Adding a popup menu to select the mode. 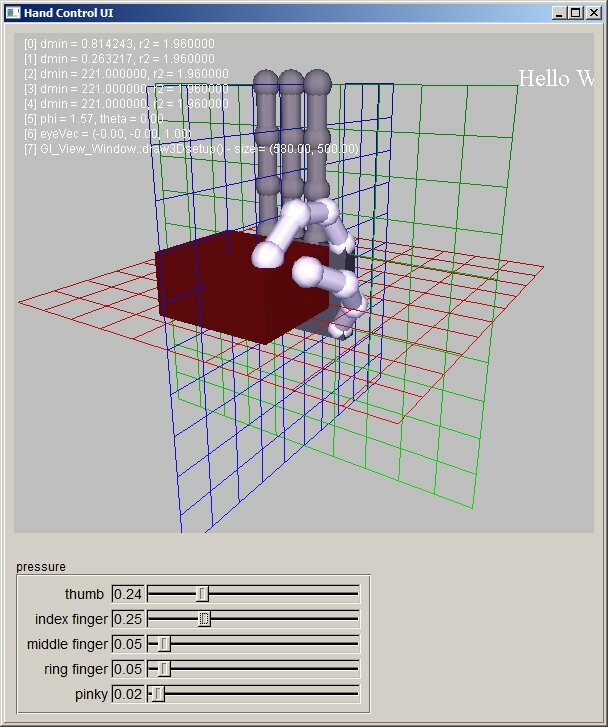 Adding the matrix analysis to get the position of the fingertips. Done for one finger. Need to add methods to store and access all the position information. May need orientation. If so then I could subtract the position from the current matrix, then multiply a vector by the resulting matrix. This entry was posted in Feldman Project, Phil on January 25, 2012 by pgfeldman. Going to send string messages across and print them to the console, after testing the more basic functions. Added some checks for null pointers so it doesn’t crash. This entry was posted in Feldman Project on January 25, 2012 by pgfeldman. 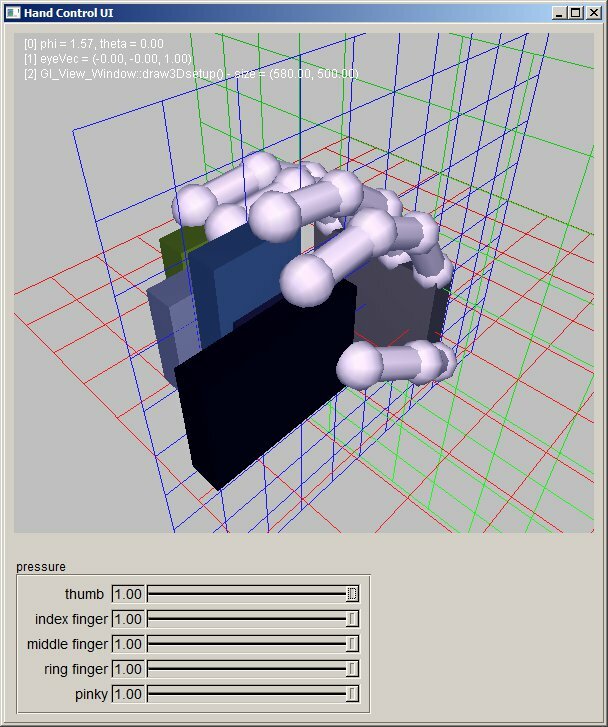 Well, I was hoping to use the MODELVIEW_Matrix to determine the orientation vector of the camera, but no luck. Time for classical spherical coordinate transforms. Transposing Y and Z, since OpenGl likes to have Y as the up vector. And that is now working. Note that we had to multiply the x component of the view vector by -1. Started on the HandControlUi fltk class. This entry was posted in Feldman Project, Phil on January 24, 2012 by pgfeldman.